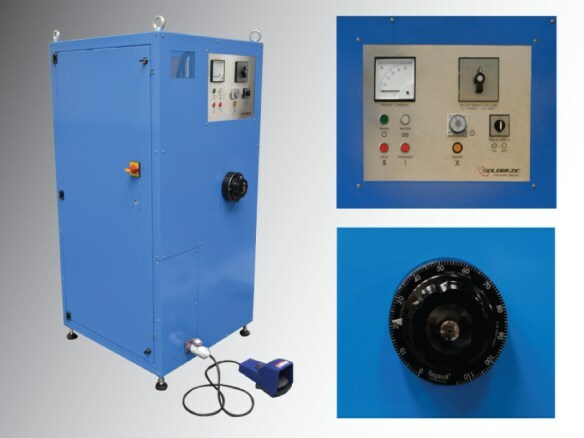 The Solbraze TP8 30kVA Resistance Brazing unit is a low voltage, high current power supply with a variable power output. The maximum input power is 30kVA based on a 75A supply at 400V. The system is designed to operate at both 50/60Hz. The Resistance Brazing unit has been designed for up to 95CSA cable brazing but other models can be built to suit other sized cables and the unit can be used to braze other brazing applications. A 30kVA transformer is at the heart of this unit and includes auto-transformers and a variable transformer that are used to create the high current but low voltage output. The TP8 can be used in the regions of the world where 480 or 400 Volts (50 or 60 Hz) are used by simply turning a switch. The control system and peripherals, such as the water cooler, are 24V DC and 240V/110V AC, single phase, low current systems. The 30kVA transformer has primary tappings, which trim the output to give secondary voltages of 1-4 Volts (on both 480 and 400V AC input supply). The primary transformer tappings are selected by use of the rotary switch with positions marked 1-2-3-4 and OFF. With the 5 position rotary switch tapping selection set in positions 1 or 2, the variable, hand adjustable, transformer fitted to the Thermopak allows the output voltage to the main 30kVA transformer to be varied from 0 – 100 % depending on the application, components or cable size. This enables the output voltage (low voltage resistance brazing current which defines the brazing temperature) to be finely tuned to suit the required brazing conditions for smaller wire sizes. The variable transformer does not operate when higher currents are required in the remaining switched positions, 3 or 4, which will apply to larger CSA wires or components. The TP8 can be supplied with a resistance brazing machine head which is cooled by a water cooling system to the electrode blocks which hold and position the cores for splicing up to 95mm CSA size conductors. Water-cooling is required to protect the wire core insulation from thermal damage during the resistance heating process and ensure maximum working efficiency. Confirmation of the correct water pressure is made by a pressure switch located on the unit. This is indicated by a white lamp on the control panel and is failsafe if water pressure is not present and therefore not sufficiently cooling the brazing heads. The electrode blocks are adapted to suit the various conductor sizes with bolt on split collets for each of the conductor sizes which are required to clamp and retain the position of the conductor, physically align the conductor halves over the joint and complete the electrical brazing circuit. Using the footswitch to switch power to the electrodes may be used in continuous or intermittent mode depending on the application and wire size and will depend upon the developed procedure and technique and the different heating requirements of the brazing materials that have been specified. The ammeter provided indicates the current in amperes drawn from the supply when the transformer is delivering power.